Sarah Stephenson, Owner of Kitty's Cakes, has been making special cakes for more than thirty years and has a considerable and well-deserved reputation. Her love of baking shows in everything she does. She lavishes the same care and expertise on each cake, be it a simple birthday bake or an elaborate tiered cake for a glamorous wedding. What makes Sarah’s cakes exceptional is that, as well as looking sensational, they taste delicious too. She always uses the best ingredients available and can work with most dietary requirements. Kitty's Cakes is based in Suffolk and Sarah welcomes couples to her home in Laxfield to try samples of cake with a cup of tea or coffee while they discuss their requirements. The Gainsborough Quartet is a professional String Quartet based in Suffolk and can provide music for your ceremony and reception. Our extensive repertoire of classical, pop, jazz and music from the shows can be tailored to your special day. All of us are classically trained and between us we have played for The Queen, Lady Diana Spencer, Tony Blair, Yehudi Menuhin, Hayley Westenra, Michael Parkinson, Nigel Kennedy and many more. It’s simple – the more fun you are having, the better photographs I will get. I try to create simple, honest but extraordinary & elegant photographs that you will treasure for the rest of your lives. I appreciate a “hands-off” approach and tell the story of the day in an informal and as natural a way as possible. An incredible venue like Bruisyard let’s me do that perfectly. To me, Bruisyard Hall is as an ideal a wedding venue as you could hope for. It is full of old world charm and elegance yet is homely and relaxed. It can be a blank canvas for you to paint your own wedding picture or you can leave it all to the incredible team and suppliers to do that for you. Although Bruisyard has it's own distinct identity, no two weddings are the same. The thing every wedding day does have in common though, is the warmth of the welcome. It is a very special and unique venue to be a part of. I want to get to know you, hear your story, and create a special connection with you. True love stories fuel my passion to capture moments that reflect who you are, make you feel amazing, and ultimately blow your mind. Photography has played a huge role in my life and I feel truly blessed to be living the ultimate dream, making a living doing what I love. I am proud of the work I have produced and genuinely feel honoured every single time I am entrusted with capturing the love of two people and telling their story. My wish is to tell your story with fresh, honest, vibrant images that are as special and unique as you are. No gimmicks. No weird angles. Just you and your love. I would be honoured to join you both on your special day and I promise to give you my whole heart in return. As one of Suffolk’s leading mobile beauty therapists and make-up artists, based in a beautiful rural village close to Bruisyard Hall, I am delighted to offer a wide range of beauty treatments and make-up artistry in the glorious setting of this perfect Suffolk wedding venue. 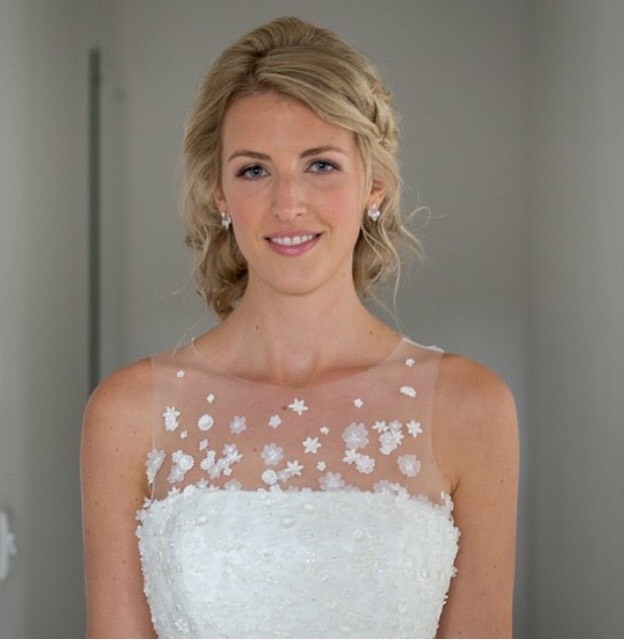 I trained at the London School of Beauty & Make-Up, and specialise in bridal, fashion and catwalk artistry, which I love! With over 15 years' experience, I am also trained in a number of others areas including: reflexology, lash extensions and airbrush make-up. I understand each individual bride simply wants to look perfect. That's why I take away their worries and create a style for brides that compliments their natural skin tone and ensures they look beautiful all day long. It would be my pleasure to work with bridesmaids, mother of the bride and special guests too. Lynnette Chasmer is an award winning wedding hairstylist with over 20 years experience in the hairdressing industry. 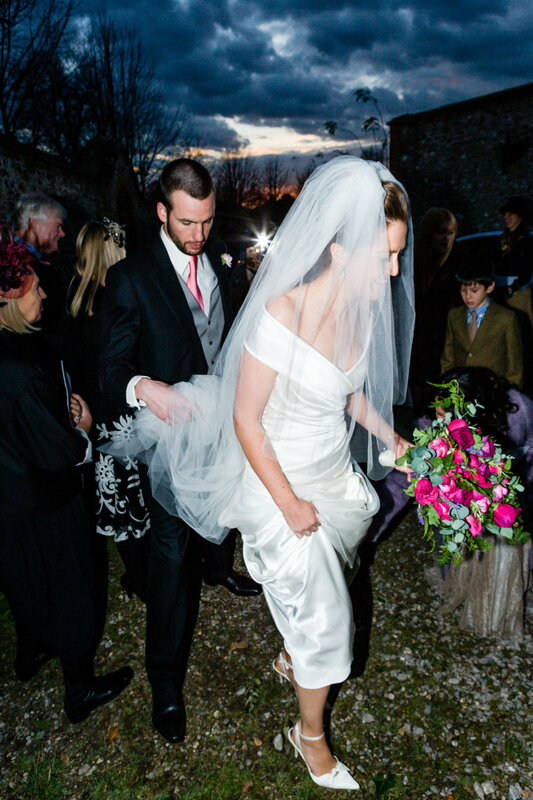 Her renowned service offers a completely mobile service on your wedding day, travelling to Bruisyard Hall to create the perfect style for you and your wedding party. With Lynnette's creative skills and knowledge, she is able to create the most beautiful, current wedding hairstyles that today’s brides desire whilst giving expert advice on your wedding style choice, taking into consideration your wedding dress, accessories and hair type, ensuring your complete bridal look works together and lasts the whole of your wedding day. With the option to team-up with Bruisyard Hall's recommended make-up artist Victoria Bradfield. They will ensure your morning runs seamlessly and will stay until you are dressed and your veil is in place. At Moat Farm Flowers we specialise in using our home grown - and British grown - flowers. We are just 4 miles from Bruisyard Hall so these could hardly be more local. We grow and pick the flowers for your wedding, so seasonality is the key, as well as freshness and flowers with lots of scent and character. We love decking out Bruisyard Barn with our big arrangements, it is a beautiful space to decorate. Table decorations can be opulent or more relaxed and rustic. We will deliver your bridal flowers on the morning of your wedding. We can also provide extra buckets of flowers for brides and their families to do their own table centres too! All of the team at Bruisyard are extremely helpful, friendly and efficient so it is always a pleasure to work there. “Dominic has everything a couple need in a wedding photographer: skill, commitment, dedication, patience and understanding. He is with you every step of the way; he is unobtrusive, empathetic and genuinely interested in you and your special day. His photographs are natural, intimate and vibrant – truly original and unique to you. From Dominic you will get much more than the average; you will get a photographer who goes above and beyond the service you expect, and who feels part of your family by the end of the day.” Amy & Nick. Where do I start!? – The Dreamwave team simply LOVE working at Bruisyard Hall. The staff are simply awesome and the venue speaks for itself. The Barn oozes personality. It’s rustic elegance completely matches our style of Lighting and Décor. With an array of choice from classic fairy light arrangements to more modern festoon layouts, whatever your choose, we feel our services complement Bruisyard Hall’s features perfectly. We have been working with this gem of a venue for many years and have developed our lighting services to produce customised packages that form the perfect accompaniment to create either a homely visage or impactful illumination! Just speak to your Event Manager to explore all of the lighting options available and to arrange your requirements. Everyone wants their evening party to be a huge hit. Our highly skilled team of DJ’s work closely with our clients to give the evening they envisage. Whether you want a classic wedding party; a modern, funky alternative; or your own twist, we will make this happen! Our DJ’s will make sure you have a fab party by using their wealth of experience to read the dancefloor and keep it full whilst playing the style of music you want. We have a selection of DJ Set Up’s to choose from. With this, you can select the lighting colour to either create that vibrant party atmosphere or a more “weddingy” feel with our natural warm glow. Whatever the kind of evening your looking to achieve, we will work with our clients to realise it! Here at Something Borrowed Prop Hire we understand the importance in the small and finishing details. Our aim is to supply beautiful venue décor that will give your wedding or event that added ‘wow factor’, not only are our props great statement pieces but they also provide fantastic photography backdrops for both yourself and your guests. Our props include – our Illuminated Love Letters and Light Crates, the crowd-pleasing Donut Wall and Prosecco Wall as well as our stunning vintage Floral-Framed Mirror and classic style Post-box with a modern twist. We provide a professional delivery, set up and collection service as well as personalised package deals, allowing couples to create their own set of props that will suit their wedding and style. To see our full range and for more information about what we offer take a look at our website, where you can also get in touch to discuss creating your very own package deal. Since Chase Stereo presented by DJ Mervyn Roberts was launched in the mid 80’s, we have performed at 100’s of weddings, mainly through being booked via recommendations or referrals from past bookings. With our experience and know how, we can simply offer you the best wedding party entertainment and provide you with a real wedding party atmosphere. We use our great music knowledge to design playlists for all ages & tastes, playing great tunes that you like & have selected. Plus our high tech equipment & choice of one of our professional colour coded disco setups “ultra modern” or “vintage rustic ” which is presented by our experienced team to our high professional standards. Mark discovered a passion for photography aged fourteen in the school darkrooms. He has won awards from the Association of Photographers and was selected for the Taylor Wessing Portrait Prize. His work is in the collection of The National Portrait Gallery and he has worked as stills photographer on many feature films including Phantom Thread, Gosford Park, Moon and Mrs.Brown. 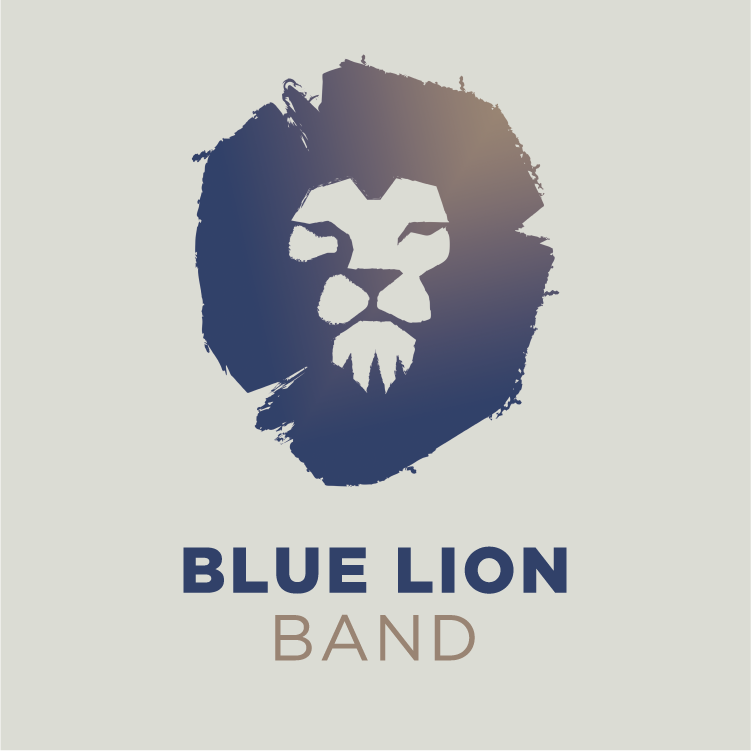 The Blue Lion Band are full-time professional musicians who perform at some of the UK’s biggest events and festivals. Customise your band by choosing between 4-15 musicians, in a variety of ensembles to suit your event and budget. We can perform at your ceremony, reception drinks, wedding breakfast, and then party on into the night. The Blue Lion Band play a wide variety of tunes, but our trademark speciality is up-tempo festival-style music - capable of everything from chart classics, funk grooves, soul, swing/jazz to current top 40 and dance hits. A designated music producer will work with you from pre-booking through to your big day. Plus, our unique website provides your very own band planning page. Come along and hear us play at one of our free live showcase nights in Cambridge or Norwich. Myblissfulretreat is a visiting spa company offering you bespoke treatments in the privacy of your home or wedding venue. Vicky and her team of therapists have over 15 years experience between them and are excited to deliver you the most relaxing treatments, from luxurious massages to bespoke wedding packages. 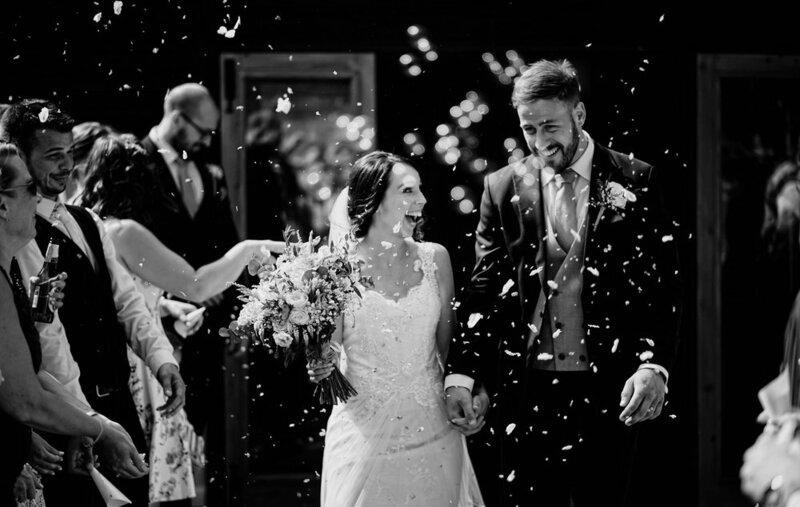 I like to see beyond the lens and put myself within your wedding day to capture the events as they unfold so you can relive the day through my create eye with a natural relaxed documentary style, dark and moody but crazy enough to say we want that gin lover, coffee drinker, crazy off the wall photographer at our wedding. Please provide coffee and gin to keep me happy all day. We can make your wedding dreams a reality. Our family-run business can cater to any of your floral needs whether it's a small, intimate wedding you dream of or a large dramatic wedding with cascades of flowers - no display is too big or too small. We offer a bespoke Dog Chaperone Wedding Service and can chaperone your dog to your wedding, for inclusion in your pre and post ceremony wedding photographs! Amanda’s Ark can ensure that all your family members are involved in your wedding day, with one of our Dog Chaperone Wedding Service packages. We offer home boarding for your best-pal both before and after your wedding & take responsibility for all your dog's care and requirements during your celebrations. This is a bespoke service, fully insured, professional and friendly, with over 18 years’ experience in dog handling and animal care. 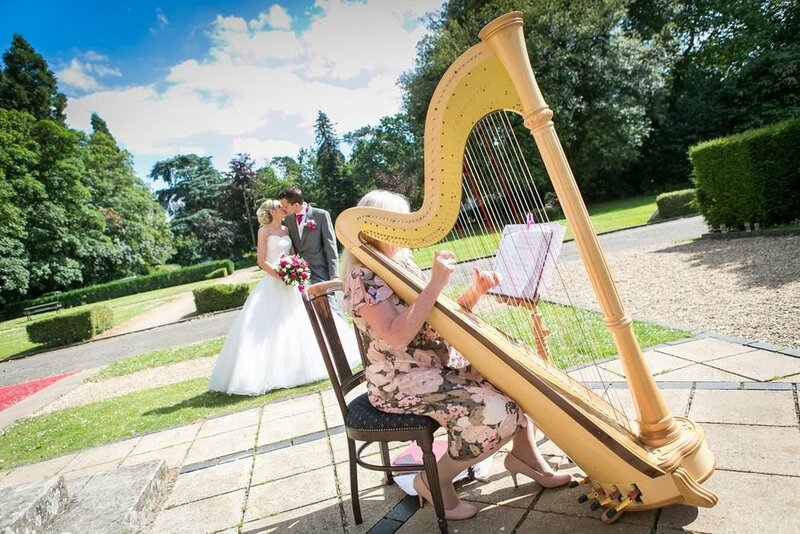 Award winning harpist Xenia Horne is delighted to offer a bespoke consultancy service working with your personal requirements as themes. With over 25 years professional performance experience, including visits to Windsor Castle, Downing St, Belvoir Castle, House of Commons, Xenia arranges music especially for your wedding ceremony and reception, from traditional wedding classics to chilled contemporary chart sounds. Her white maple concert harp with gilded soundboard, has a powerful resonance so that you can enjoy her playing indoors and in the beautiful gardens of Bruisyard Hall during summer months. Xenia offers harp solo and duet with Cello, violin, Flute also trio. Polly Pickle is an award-winning Suffolk design studio specialising in premium stationery; from save the dates, to personalised wedding invitations and matching on the day stationery. Ready available collections offer a range of unique designs, on trend colour palettes, creative typography, eye catching graphics, and high-quality finishes - bringing a serious dose of style to your wedding celebrations. Our premium open style photobooth service. We are a father and daughter team in East Anglia who deliver fantastic customer service at all times, from initial enquiry to the delivery of your photo station experience. We know how important and special your event is to you and your guests and will help make it even more fun as well as providing those lasting photo memories. Smiley Booth is the home of extraordinary events & entertainment. We are passionate about making memories and capturing shared moments of happiness and excitement between friends, family, and loved ones with our open photo station. Our Photo Station is the most up to date photo booth equipment in the industry. Allowing us to offer a whole array of photographic experiences, HD photos, gif, morph, video messaging, green screen. We are not your ‘average’ photo booth - we are hands-on and make every effort to capture the moment and interacting with your guests…people just love the results we achieve as we bridge the gap between the often random photo booth shots to the more sophisticated studio shot. Let Smiley Booth bring your family and friends together in a unique, fun and unforgettable experience and above all embrace every opportunity to make you smile.